Australian Jumping is now the ‘go-to site’ for competitive showjumpers around the country, containing all the latest jumping news and information, including photos, live results, rankings, show wrap-ups and upcoming events. This is the site that Australian showjumpers have been waiting for. 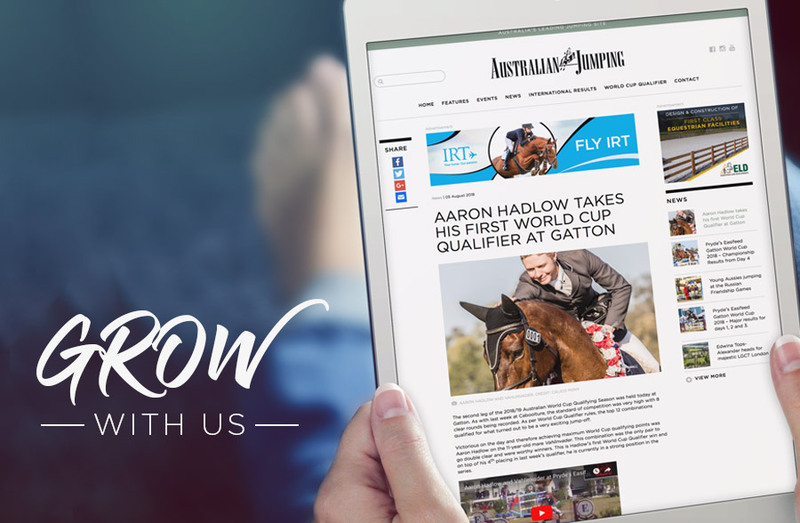 With over 45,000 unique visitors to the site and over 220,000 pages viewed per quarter, along with a rapidly growing Facebook presence with over 11,000 followers, interest in Australian Jumping is at an unprecedented high and now is the perfect time to secure premium advertising space. The site is dedicated exclusively to the interests of the Australian jumping community, which significantly increases the value of targeted jumping related advertising. Rapid growth in social media engagement and website interaction means increasing value for your advertising spend. We offer a variety of display advertising spaces to suit all budgets. Package deals are available for bookings of more than one space or over extended periods. At Australian Jumping we pride ourselves on the quality and aesthetics of our site and will maintain this to ensure we represent ourselves and our advertisers in the best possible light. To this end, all advertising banners need to be approved by our QA team and we offer free design by our high-end advertising agency partner for those advertisers requiring assistance. All advertisers receive monthly reports, detailing numbers of impressions and click-throughs from each of their banner advertisements.